EASY Contract is the modern, web-based contract management software for the creation, central management and processing of contracts. All documents, information, and other addenda can be quickly found by all involved parties, while a uniform, current information status is guaranteed. Digital contract management with EASY Contract means providing a significant gain in efficiency and transparency in your company. Anytime and anywhere. 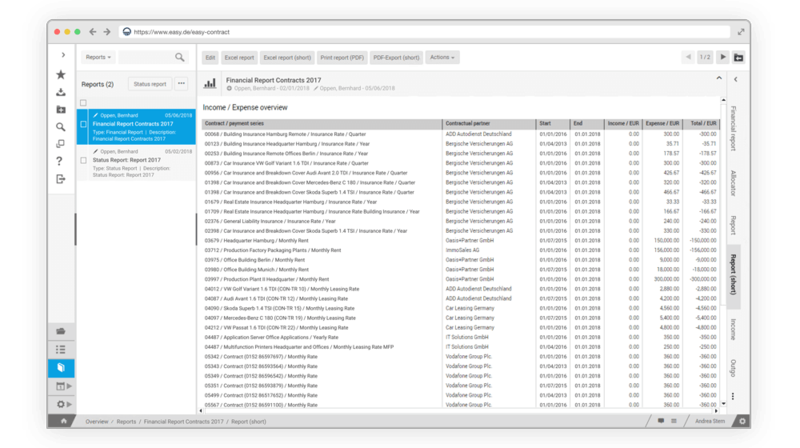 Keep an overview of all concluded contracts and receive electronic support in the creation of new contracts with contract templates. Even deadline management works in no time with EASY Contract. You are automatically reminded before the deadline expires – missing something is a thing of the past. EASY Contract keeps you up to date. If it’s allowed, even on a smartphone or tablet. Working somewhere outside of the office? No problem. Our digital contract management software is always in synch and backs up changes automatically – even after connection failures. Location-independent management of contracts of any kind; authorized representatives of the responsible departments always have access to contracts. 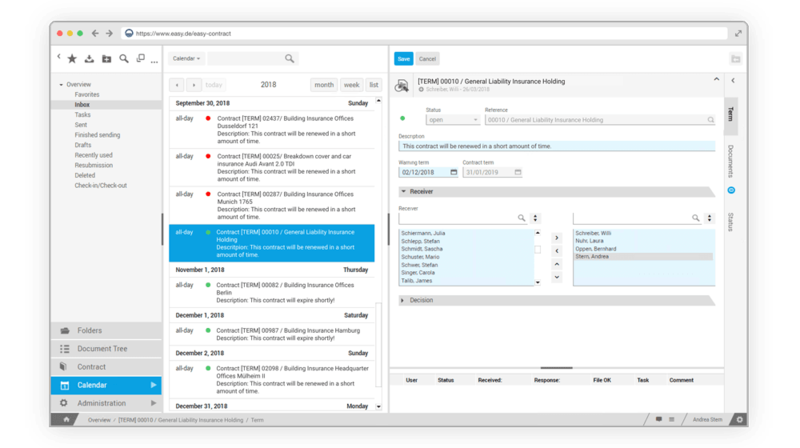 Multi-level deadline calendar with escalation mechanisms ensures that missed deadlines are a thing of the past thanks to automatically sent reminders. Storage of the contract documents in the revision-proof EASY storage system; a detailed logging of the work steps facilitates revision security. DThe authorization concept of EASY Contract stands out thanks to high adaptability while at the same time retaining clarity. This provides a clear regulation of responsibilities. Shortening of cycle times thanks to process controlled support from creation to signing of the contracts. 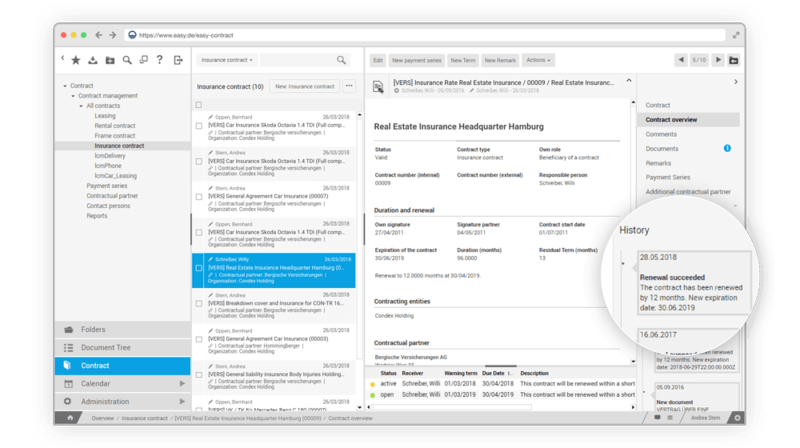 The EASY contract management software offers high-powered search options and convenient search and filter functions: thanks for one thing to the simple keywording of contracts and also thanks to the full text search option. The dashboard for the overview of all contracts is customizable if desired. That way, you always have your overview of all contracts, all important figures, data and facts available. The best part is that with a simple click on the individual graphic elements, you can drill down into a more detailed view. Even on a smartphone or tablet. And so perfect for when you’re on the way from here to there – or during contract negotiations when speed is called for. Gone are the days of back and forth by email and telephone. EASY Contract offers a chat function for every contract. Do you have questions about a contract detail? If you’re not in a hurry, just go ahead and start chatting with other colleagues who are authorized in the contract management. The best part is that the context is preserved – and that way there is no annoying and time-consuming communication about which contract the questions refer to and so on. EASY Contract structures contracts hierarchically. Framework contracts can be defined. In that case, the contract management solution dynamically creates a new tab on which all of the contracts subordinate to the framework contract are listed. Dependencies can be spotted at a glance. Modern contract management is that easy; “traveling” into the past – of your contracts – is that easy. It has never been so easy to manage a variety of payment types. No matter if there is a one-time payment for the contract or if it is a lease contract with a series of payments. You can set up several payment plans for each contract in no time – and comply with the budget planning using the contract management. Of course, you can also display this graphically through EASY Contract. Of course, deadline management is a feature of EASY Contract. Thanks to multi-level deadline calendars with reminder function and escalation mechanisms, missed deadlines are a thing of the past. 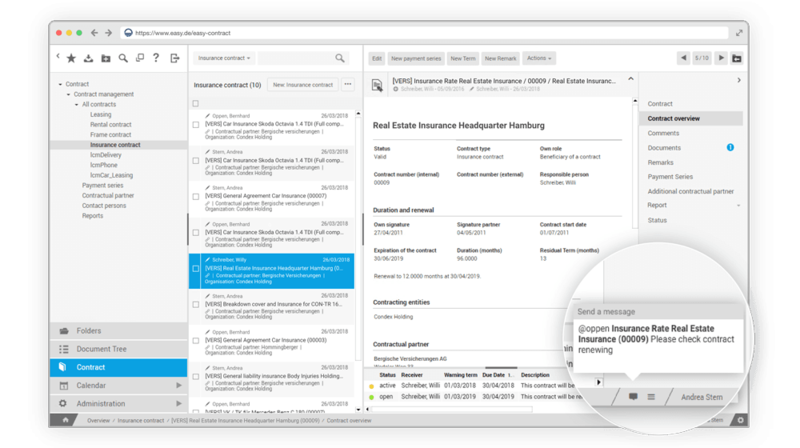 Get reminded directly in the contract management or by email. Never lose another advantage to a missed deadline. That pays off! EASY Contract is ready for enterprise mobility. Use the contract management software as an app on an iOS/Android smartphone or tablet. Or as a responsive web application on any device. A real helper when it counts – even without a working mobile network, if you happen to be sitting in a plane. Every contract in one app. Modern contract management can be that easy. 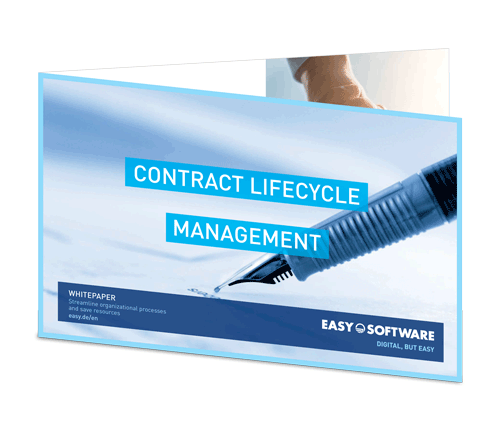 Our contract management software supports the complete lifecycle of a contract: contract proposal, contract creation, contract monitoring, contract controlling. With Contract, you have a handle on even complex approval workflows with version and template management. No matter if it’s service, maintenance, lease, cooperation, purchase, or support contracts. Regardless of the contract type – you always have secure control over your contracts and gain efficiency with EASY Contract. Contract management software that provides a wide variety of applications – such as electronic purchase requisition, invoice, and HR – with the relevant legal documents. EASY Contract offers effective instruments for valid liquidity planning. Thus, for example, you can create several payment plans per contract. Our digital contract management distinguishes between budget and target figures and delivers aggregated evaluations of the payment plans across several contracts and contract types. EASY Contract – for secure planning and meaningful controlling. EASY Contract includes an integrated contract partner and contact management which can be coupled with external sources such as the supplier master data. 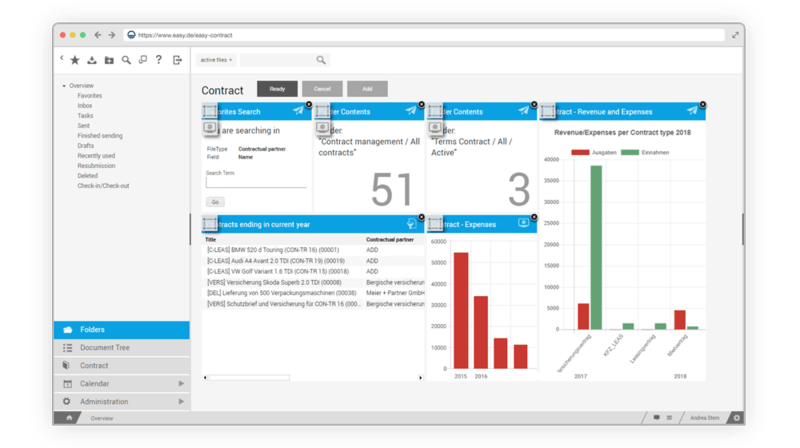 The management of contacts in the context of contract management is handled in a flash with our EASY Contract software. Companies often struggle in this context with inconsistent templates for the creation of a wide variety of contract types – from service contracts to maintenance contracts. Our digital contract management handles the provision of uniform templates for the creation of contracts. That saves time and money and ensures legal security. 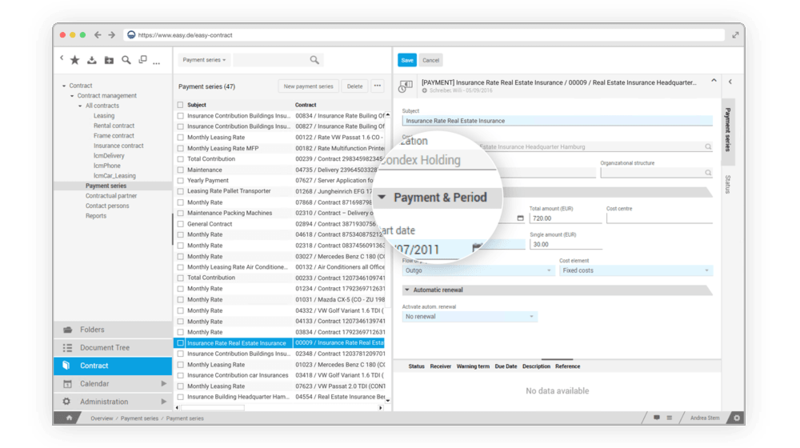 With our contract management software, you can conveniently manage a variety of payment types with the touch of a button. You keep an overview of incoming and outgoing payments and control them at the same time – no matter if it’s a one-time payment or a series of payments. Also gone are the days when contracts had to be tediously sought and an unclear contract history could lead to erroneous or outdated reporting. With the contract management software, you have a comprehensive overview of a contract’s complete history any time. Why is contract lifecycle management unavoidable? This whitepaper provides recommendations for sales, legal, procurement and finance professionals who want to grow within their businesses. What questions should your company ask itself when deciding on a solution? In tandem with Commerzbank AG, EASY SOFTWARE installed a modern contract management solution for managing vendor relations. EASY SOFTWARE implemented a contract management solution at Karl-Franzens University Graz. The goal: Transparency by standardizing previous solutions. Purchase-to-pay encompasses the process steps from the purchase of goods and services right up to payment. In this blog post, we introduce you to the most important features and benefits of an integrated purchase-to-pay process. A complete and formally correct incoming invoice is an essential resource for every invoice recipient. According to current German financial case law, the right to the deduction of input tax critically depends on the completeness and correctness of the incoming invoice. In this digital age, there is no reason at all for organisations to suffer the errors, risks and time lost to disjointed and largely manual purchase order and invoice management. In fact, it’s never been easier to transform Accounts Payable, boosting efficiency and unlocking new business value through accounts payable software and smart process automation.